Paintings are being installed at the CC Hall in Aylmer. Some of Monique’s Paintings at the Prince George Playhouse Theater in British Columbia. 2019 – 2018 – Art Display at CC Hall in Aylmer from September to the end of June. 2017 – Art Display at CC Hall from September to the end of June. 2016 – Permanent Art Display at Monique’s Studio, by appointment only. 2016 – Art Display at Christ Church Hall from September to the end of June. 2015 – Art Display at Christ Church Hall in Aylmer Quebec for a gala and concert called: May in Milan. 2013 – Art Display at Monique’s Studio in Aylmer Quebec, by appointment only. 2012 – Art Display at St. Giles Presbytarian Church in Prince George BC. 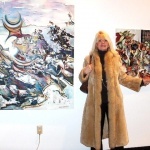 2012 – Art Exhibit at the Cercle Des Francais in Prince George BC. 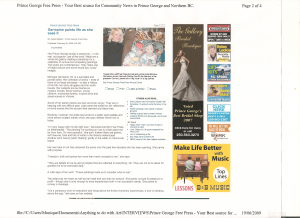 2011 – Art Exhibit – VIV’ART’S by BC Artists. 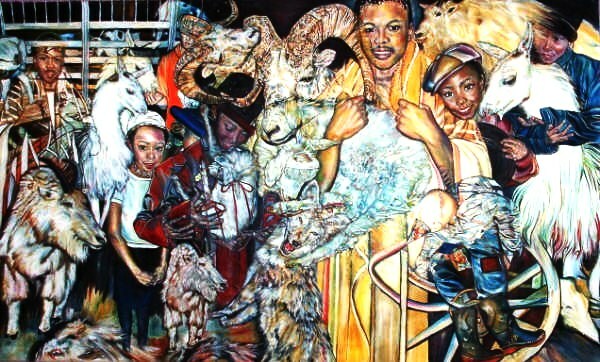 Juried exhibition explored the theme “US” at the Two Rivers Gallery. 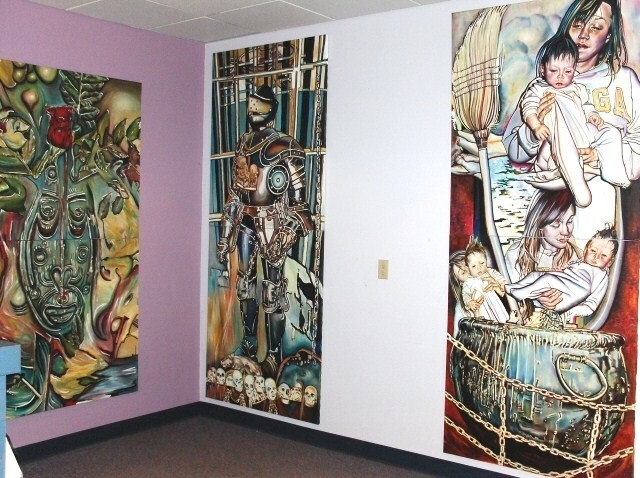 2010 – Art Display at the Galleria in Prince George to honour Francophone Artists throughout all of British Columbia. 2010 – Art Display at the Rustad Galleria to celebrate the 50th anniversary of Le Cercle Des Canadiens Francais in Prince George. 2010 – Exposition a Two Rivers Gallery de Prince George. Sponsored by the French Association or Le Cercle Des Canadiens Francais. 2009 – 10 – Art Display at the Art’s Council, Prince George BC. 2007 – CBC Television Interview shown across Canada on June 6. Installation of one of Monique’s paintings at what used to be Galitas in Prince George BC. Galitas was an awesome place where you could have fine dining, concerts and art shows all year long. My paintings were there on a permanent basis which was the one of the artist’s favorite place at the time. Art Display at “Le Cercle Des Canadiens Francais” Prince George, BC. Art Display at the Multicultural Art Exhibit at Studio 2880 and Art Space. 2005 – “A Semblance of Truths”, Two Rivers Gallery, Prince George, British Columbia. Art Display at the Ramada Plaza Hotel, Richmond BC. 2004 – Juried Show “Found” at Two Rivers Art Gallery, Prince George, British Columbia. 2003 – 2004 Monique Germaine “Retrospective” at ArtSpace, Prince George BC. Radio Canada interview with Ghislain Basque, Vancouver BC. One woman show at Silver Lake Camp, Peachland, BC. 2000 – 2001 One Woman show at Pete’s Cuisine and Gallery, Prince George, BC. Radio Canada Interview Elaine Degan, Vancouver BC. L’Express du Pacifique (Vancouver Newspaper). Veronique Goyette was the journalist. One woman show entitled “Making the Unconscious Conscious” at the Island Mountain Arts Public Gallery and Art School, Wells BC. 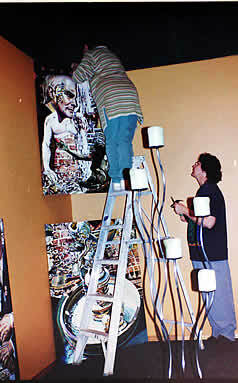 1998 – Juried Show “Other Eyes: Art, Racism and Stereotypes.” Displayed at UNBC and sponsored by the Prince George Art Gallery. 1997 – TV interview on “Courants du Pacifique” Vancouver, BC. 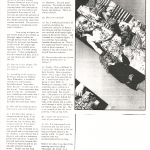 Joyce Janvier was the reporter. 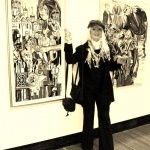 1996 to 1999 – One woman show at Gallitas Gallery and Restaurant. 1994 – Presentation of Art Material at Suttro Park, San Francisco, USA. 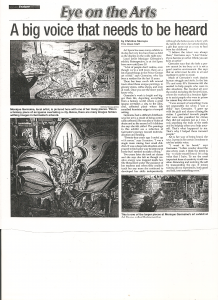 1993 – Art show at Artistic Differences Studio, Prince George, BC. 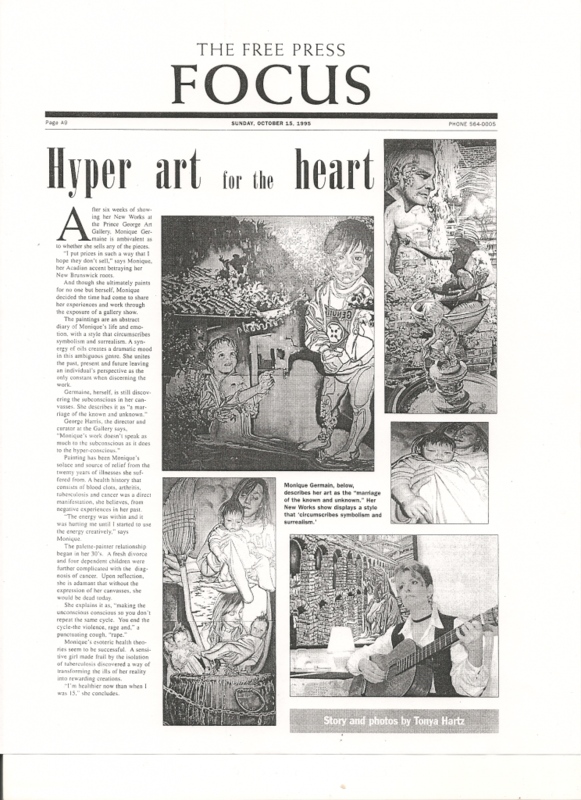 1991 – Art Exhibition at the Prince George Gallery, Prince George, BC. 1986 – One woman show, Killarney Church , Edmonton, Alberta. Art Exhibition at the Mayfield Inn, Edmonton, Alberta. Keep in mind that the artist learned a great deal from spending time in well known Art Galleries in Europe and North America, galleries such as The Prado in Spain, the National Gallery in London just to name a few. Monique has been fortunate to be mentored by wonderful Canadian Painters. One of her wishes has been to make the (Unconscious Conscious) through her art in the hope of uncovering the mysteries of her past and her efforts have paid off beautifully. 1986 – 1988 Private lessons for 2 years from Tim White, Artist and Teacher from Vancouver BC. 1986 Vancouver Vocational Institute. Vancouver BC. 1984 – 1985 Athabasca University, Edmonton Alberta. 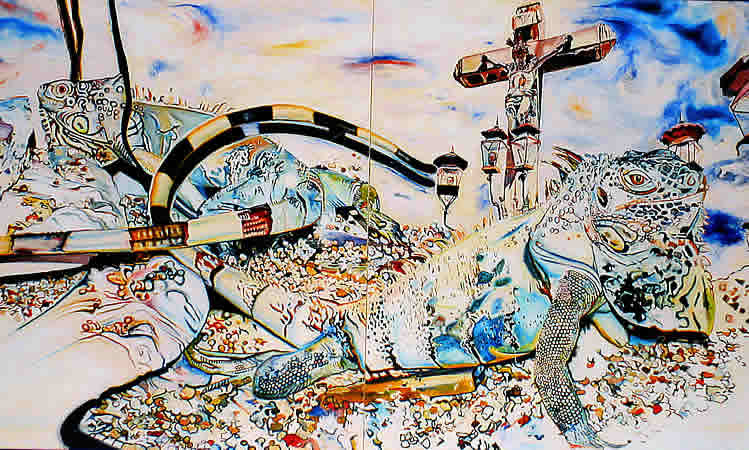 1981 – 1984 Grace Ellen, artist and teacher, Edmonton Alberta, (Art Training Program). 1962 – 1964 Feller College, Grande Ligne, Quebec.